Some of you read the original story when it was published in the “A Very Paranormal Holiday” anthology. Facing the Darkness has not been available since spring of this year, and I’m sorry to keep some of you all waiting who hadn’t had the chance to get it. I wanted to take the time to revise and expand it a bit before re-releasing the novella on its own. Plus, it made more sense to publish it closer to the holidays where it fits best. Originally, Facing the Darkness was about 18k words, but it is now around 22k words. I had a new editor go through the manuscript who had not read any of the Sensor Series and help me revise it so that even people just jumping in could follow along. This story features Kerbasi (a character many readers both love and hate) and a glimpse into his journey for redemption. This time, he’s tasked with spending time with a dying boy around Christmas. If you’re looking for something heartwarming to read as the holiday season gets closer (with a bit of a paranormal twist), this might be the perfect read for you. And it will only be 99 cents! The cover and other details are below. Facing the Darkness releases November 30th. Darkness Wanes is now available! I know you all have been waiting patiently (or in some cases impatiently) for the sixth and final novel in the Sensor Series to release. Darkness Wanes is now available at Amazon and the other major retailers (see the bottom of this post for all the links). This novel ended up being just over 126k words long in order to wrap up everything relating to Lucas and Melena (though a few open threads are left for spin-off books with other characters). It took a long time to get this novel finished, but I’m pleased with how it turned out and hope you will be, too. For audio listeners, my publisher just let me know Darkness Wanes will be released on June 21st in audio format. They’ve got it on schedule with the same narrator who has handled all the other Sensor books. There is also a bonus holiday short story featuring Kerbasi, titled An Unexpected Gift, included at the end of the book. I originally revealed the story over at Nocturnal Book Reviews in December, but it has not been available in an ebook until now. On the Sensor Series timeline, An Unexpected Gift falls after the end of the main series so it does give you a little glimpse into how things are going for some characters approximately seven months down the line. There will also be full-length spinoff novels set in the Sensor World in the future. I expect to release the first one in early 2017. For the rest of this year, though, I’ll be focusing on the dragon books. Below is a summary for the novel and links to the retailers. Thanks to everyone who has stayed with me to the end of the series. All the kind words of encouragement and messages from fans have meant a lot. Melena Sanders is locked away in Purgatory, which is no vacation, but she’ll soon be returning to Alaska where troubles are mounting once again. Suspicious fires are breaking out, supernaturals are being attacked, and there’s an enemy lurking out there waiting for his chance to strike. Her lover, Lucas, is managing to hold their home together during her absence, but he’s more than ready for her to return. It will take the two of them working together, along with friends and family, to overcome the darkness that is about to unleash. For those who celebrate, I hope you have a Merry Christmas! Please take care if you’re traveling. I also want to remind everyone that the Sensor series holiday short story I mentioned in my last post is up over at Nocturnal Book Reviews. This is an all-new story you haven’t read before featuring Kerbasi, Kariann and a new character . Check it out and leave a comment on the post for your chance to win a blue Kindle Fire HD 8, tote bag, and other goodies. You’ve got until December 30th to enter. 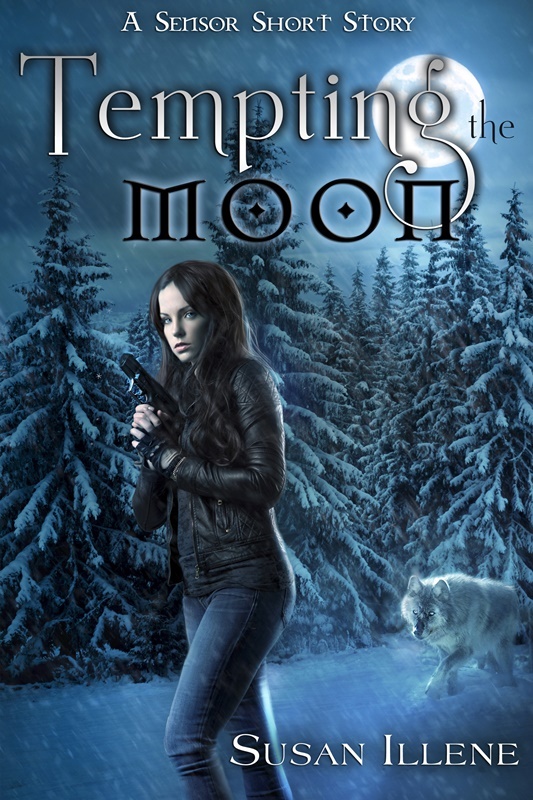 Tempting the Moon now available! For those of you who missed it, Tempting the Moon is now out. Originally published in The Stroke of Midnight anthology in late 2013, it has since been revised (adding almost 2000 words to the story) and re-released on its own. With the new year here, it’s the perfect time to pick it up! If you didn’t catch it before, the Christmas anthology is ready! A Very Paranormal Holiday is currently not available on retailers, but you can get a free copy of it by emailing me or leaving a comment below. Those who do so will be added to mailing lists of the participating authors so you can receive alerts for their new book releases. With my 19k short story that is included, Facing the Darkness, you’ll see many familiar characters from the Sensor series. There are updates on what they’ve been up to since Darkness Clashes, a revelation on Cori’s background (the tattoo artist), a fight scene, and quite a bit of character development as Kerbasi learns an important Christmas lesson. I’m also going to be re-releasing a New Year’s story later this month. For those of you who picked up and read The Stroke of Midnight anthology you will probably recall Tempting the Moon. It’s often referred to as Emily’s werewolf story, though it’s told from Melena’s perspective. The story was written between Chained by Darkness (book 2.5) and Darkness Divides (book 3). Maybe we could call it 3.7? That is while Lucas was still confined in Purgatory so you won’t see him in there, but you will see Micah and a few other familiar characters. For those who didn’t read this story, you missed the turning point in Emily and Hunter’s relationship. This is your opportunity to find out why Emily later gave him a chance. Plus see Melena get into more trouble. As soon as the anthology is available on retailers I’ll post links here and send a message to my release alert subscribers. Those who have also signed up for the newsletter will be getting the first one at the end of this month with book release information and other publishing news.